As we enter into the season of Advent, I offered a homily this evening that included inviting the parishioners, and myself, to use this time when we are called to be “watchful” and “ready” as a sort of annual self-assessment. A few hours later, preparing for Evening Prayer I and changing out my Liturgy of the Hours for Volume I – Advent, I happened to encounter a series of prayers. These prayers were those which I have kept tucked in the cover, carrying them with me as I would pray the Hours, and perhaps less frequently than I should, actually referring to them. Let me share with you what prayers I have collected, which mark in some sense my formation journey. I begin the Liturgy of the Hours each day with the prayer offered by Cardinal John Henry Newman, “Only Jesus;” it was at the suggestion last year of my spiritual director that I consider that prayer as a guide on my priesthood journey, and it has become a constant, daily reminder and guide that whatever may be worthwhile in each day must have its foundation in Jesus, asking for the grace to spread His fragrance wherever I may go or find myself. Tucked into the cover, there is also the Novena Prayer to the Immaculate Conception, which we offered at Immaculate Conception Seminary this past year, leading up to our patronal feast on December 8th; my current parish plans an evening Rosary novena anticipating this feast of the Blessed Mother, beginning tomorrow night. The timing of discovering this prayer in my Breviary is good providence, as I will in spirit be offering that novena once again with my brothers still studying at ICS, and will remember especially their study for exams and papers in these next several days. Know that along with the Legion of Mary here at my parish, we will be praying for you these next nine days in a special way. There are never enough ribbons to mark all that is needed in the Hours, and one bookmark I have included was prepared in commemoration of the dedication of the Chapel of the Good Shepherd at ICS, which incorporates the prayer from the Rite of Ordination: “Keep always before your eyes the example of the Good Shepherd who came not to be served but to serve, and who came to seek out and save what was lost.” May I always take these words to heart, and remember to offer them not only for my own vocation, but for all those in formation now, and in the years to come. As he left Mass this evening, one of our parishioners asked me if I realized that this would be my “last First Sunday of Advent” as a deacon? I truly had not thought of my journey in those terms, and place myself fully in God’s hands as I continue my formation in the months ahead, with the help of God’s grace. What I realized as we spoke, however, is that my vocation journey is constantly supported by so many, like him, who are holding me up in their prayers. Know that I feel the love and grace, the fruits of these petitions, each day. 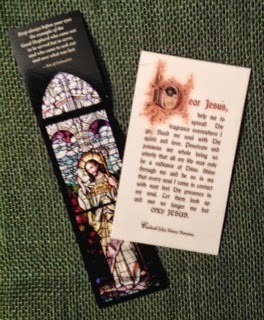 What I can also say, with certainty, is that as I shuffle these prayer cards from the Ordinary Time to the Advent and Christmas “Liturgy of the Hours,” the prayers represented by these novena and holy cards are only a hint at the prayerful support I feel from all those who have been, and continue to be the foundation of my journey. To my family and friends, parishioners at several parishes, faculty and formators at both LaSalle and Seton Hall Universities, and so many others, thank you for your continued prayers, offered for me and my fellow seminarians; keep us, and your parish priests and bishops, in your petitions to Jesus each day, for it is truly the hope and prayer of all in parish ministry that you, our parishioners, look up and see no longer us, but only Jesus. May you keep watch this Advent, and be given the grace to encounter Jesus every day.